Hey hey! 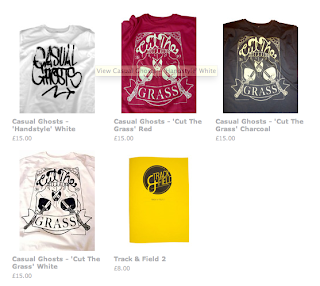 Got a quick update on some Notts fashion and music..Our mates at Casual Ghosts have been hard at work designing the new range of threads, and a sick new tune + vid featuring a new tune from Fable (PNG) and MC Karizma..we highly recommend you check em out! Casual Ghosts (Featuring Fable & Karizma) from Casual Ghosts on Vimeo. The tees are all up for sale on the Casual Ghosts Bigcartel page..but hurry up, they're selling fast!